Prolific cartographer Anna Meyer of ghmaps.net has been a friend of the Greyhawk community, not to mention Greyhawkery for a long time. For the first time I can ever remember, someone I know (outside Paizo) is being nominated for an Ennie award at Gencon 2014. Voting ends in a couple days so if you haven't already, vote for the underdog in this year's Best Cartography category, Anna Meyer's Atlas of the Flanaess. Welcome back Greyhawkers! Let's get back to my all important promoting of page twenty-nine in the second chapter of our ongoing Castle Greyhawk graphic novel. Follow the links above to get bonus words from dedicated scribe Scott Casper. Alternatively you can view the pages HERE, courtesy of Maldin's Greyhawk. Artist's Commentary: Well we saw the defeat of Drake last episode, so now we focus on Gronan. The surly mercenary is more shrewd than the temperamental captain however. 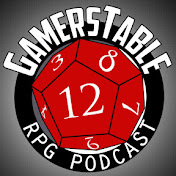 The story begins to curve back toward Castle Greyhawk. I can't wait to see how this turns out! "The Wind Dukes of Aaqa are the legendary creators of this artifact. It is said that they constructed the Rod to use in the great battle of Pesh where Chaos and Law contended. There, the Rod was shattered and its parts scattered, but the enchantments of the item were such that nothing could actually destroy it, so if its sections are recovered and put together in the correct order, the possessor will wield a weapon of surpassing power." 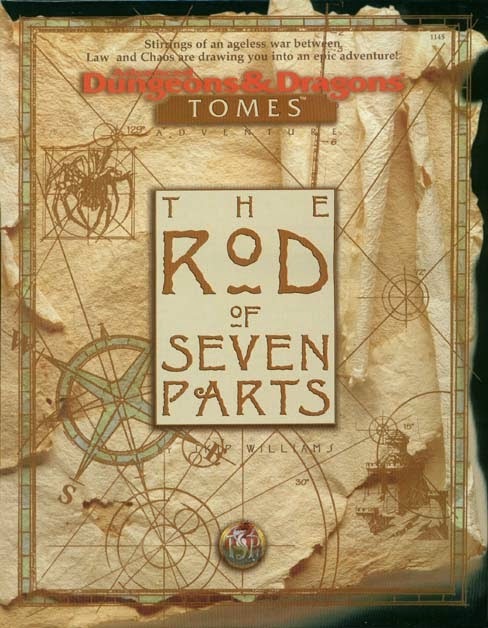 During 2nd Edition AD&D (1996), TSR put out an epic boxed set adventure the aptly named The Rod of Seven Parts. This quest is quite simply to recover the pieces of the Rod before the Queen of Chaos' agents in order to prevent Chaos overtaking all of Oerth (or whichever game world used). Anyone who has read Michael Moorcock's Elric series knows how high the stakes are here. This is fun part. In conjunction with the adventure, Dragon #233 published an article by Skip Williams (who also wrote the adventure) titled Game Wizards: The Rod of Seven Parts. The article is smart overview of where to place the different chapters of the adventure in established worlds such as Greyhawk, Forgotten Realms, Planescape, etc. Spoiler alert, the climatic chapter of the adventure involves Chaos waves changing the face of the world with which the PCs must contend. The suggested Chaos effects are truly the delicious part of this article that you won't find in the boxed set. The flooding of the Sea of Dust, which becomes a shallow sea of salty, polluted water. The transformation of the Azure Sea into a sea of tall grass where caravans of elephants make their way to the Pomarj and the Iron hills from the depths of the Hepmonaland Jungle, which becomes known for its verdant purple trees and venomous, flying reptiles." Skip only gave three examples but you get the idea here. By using this type of world spanning Chaos effect (Rod story or not) an aspiring DM can mold Greyhawk's very familiar map into anything you can imagine! This sort of alien landscape will surely throw players out of their comfort zone and make them eager to "save the world" by getting the Rod to counter or destroy whatever source of Chaos magic is causing the changes. Recently my friend took his family on vacation and he brought me back a curio that is quite fitting given our long history playing Greyhawk. The pic on the left is a piece of Malachite, an opaque, green banded copper-based mineral found pretty much all over the world. The stone is quite interesting to me as a D&D player on many levels. What Greyhawk fan has never heard of the infamous Malachite Throne where the Overking of the Great Kingdom rules with an iron fist? "Known also as the Fiend-Seeing Throne, it was well named for it could open a portal to the very Hells themselves. Those who sat upon it were invulnerable to harm and gifted with true sight. However, use of such powers often came at the cost of the wielder’s sanity, as the ruinous reigns of the four overkings that sat upon it after Ivid I so clearly demonstrated. The tale of the Malachite Throne’s origins is widely discussed among the learned. Led by fiendish allies, Ivid discovered a place of surpassing evil known as the Cauldron of Night. In its midst there stood a huge block of green malachite. Over the next three years, a coven of mage-artificers and priests of Hextor worked on the block, shaping it into a mighty throne and drawing upon the malign eldritch energies of the Cauldron to imbue it with its terrible powers. Their work completed, Ivid’s servants bore the new-made artifact out of the Cauldron to begin its long procession to Rauxes. It is said that its first port of call was the ancient metropolis of Rel Astra, where the sight of it before the walls with Ivid seated upon it was enough to secure the city’ surrender and the defection of the House of Garesteth." It's a damn shame the heraldic colors of the Great Kingdom is Blue & Gold because Green and Gold would've made the Malachite Throne more fitting. 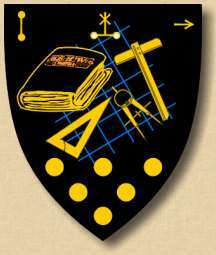 Gygax knew a lot of esoteric information and used it liberally when he designed D&D and the World of Greyhawk. Gemstones is one of those things he seemed to place extra emphasis on. For example, the Guide to the World of Greyhawk breaks down each country's predominance of gem resources from base value I (10 g.p.) to IV (1000 g.p.). Plus he even depicts a rune/glyph for precious gems. Furthermore, Gary's 1st Edition DMG has exhaustive lists of gemstones including their description. 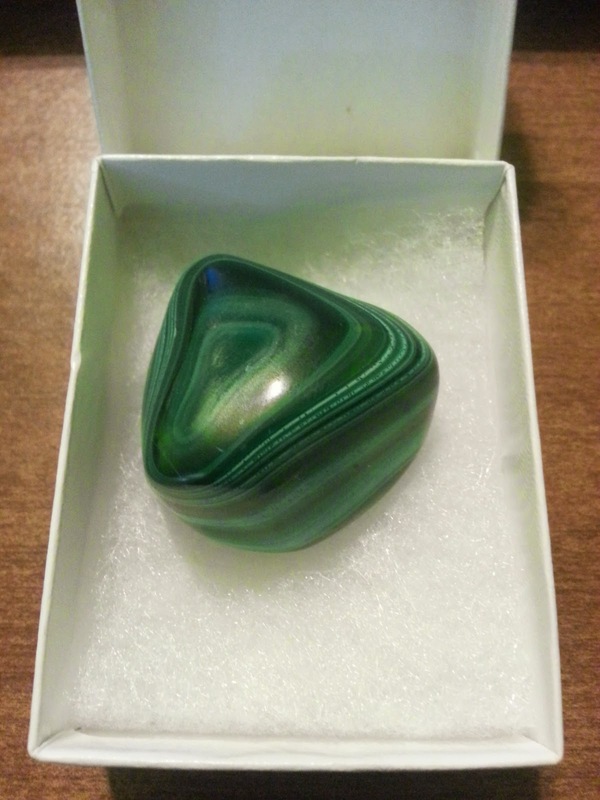 As such, malachite is merely an ornamental stone (base value 10 g.p. ), opaque and striated light and dark green. Gygax isn't done however, he takes it a step further in the next list showing the "reputed magical properties" of gems. According to this, malachite evidently offers protection from falling! That's good to know, especially if one is perched on the edge of the Malachite Throne. Welcome back Greydenizens! Yup, once again I'm a week behind in promoting page twenty-eight in the second chapter of our ongoing Castle Greyhawk graphic novel. Follow the links above to get additional story from plot weaver Scott Casper. Alternatively you can view the pages HERE, courtesy of Maldin's Greyhawk. Artist's Commentary: A long and tumultuous series of events feels like it's finally nearing conclusion in this second chapter. Drake and Gronan have been through a lot and have to be dog tired. Captain Drake is actually much worse off physically and emotionally. Gronan is just frustrated. Turns out those wizard's pouches and bags holding components are not just for show after all. Tenser may have the upper hand but what next? First off, not too many pieces. 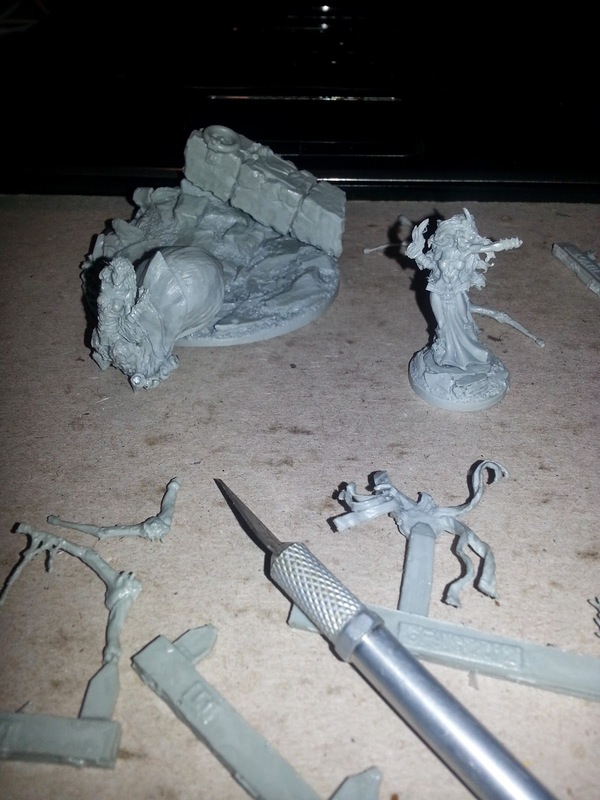 Resin minis have a good sculpt, but they are fragile at times so naturally I'm going to break off something I shouldn't. Lolth in drow form is four pieces (base, body, ribbons and pointing hand). Lolth spiderform has a large body, eight legs (labeled left and right 1-4) and an arm that carries a spear. The spear includes two ribbons as well (moe on that later). The base includes a fallen column with a ring set in it. Very cool. Lolth leans on inset points in this base. No problem right? As you can see putting the drow Lolth together will be easy (I put the hand and back part of her hair and ribbons on later). The column has points that secure it to the main base. Now to figure out the giant spider and those legs. Never an easy project. 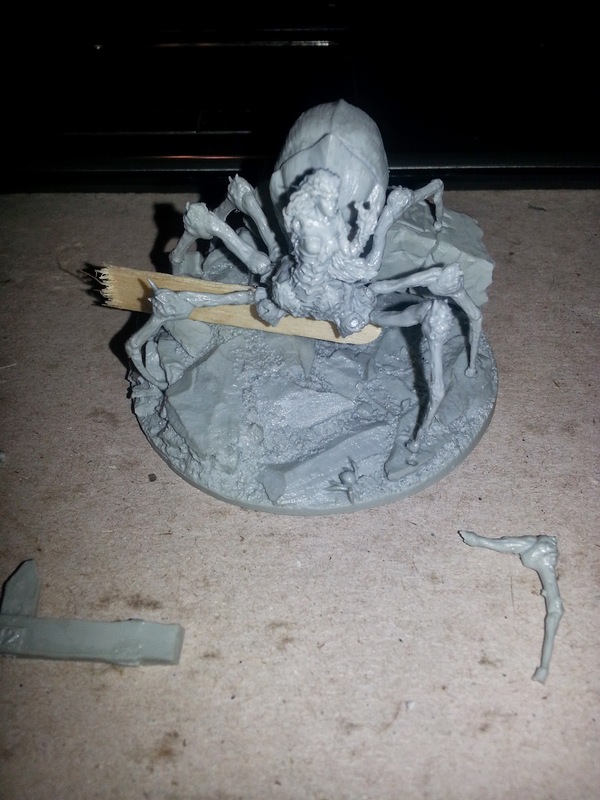 I assembled a metal figure once of Shelob from Middle Earth RP. Damn thing fell apart on me in no time. I think resin being significantly lighter and with the base having secure points will make this a sturdy figurine. I quickly found out that the other secure points for the spindly legs onto the spider's torso (thorax?) were not very good. Then there is the issue of balance. Lolth's two front legs are raised in the air meaning the other four legs support all the weight of the rather bulky torso. Fun. 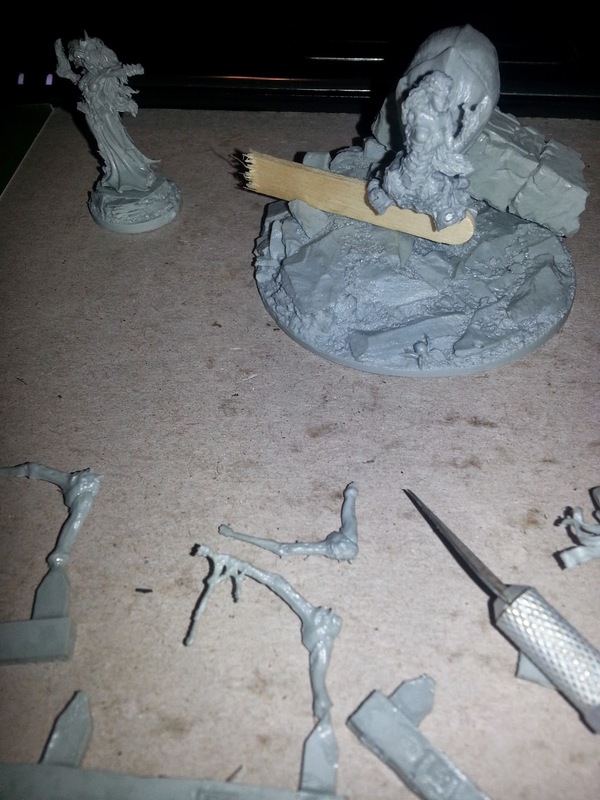 I tried to gluing legs on the torso first, but then couldn't get them in the right position on the base. Then (desperately) I tried placing legs on base first and bringing the body into alignment with those. Yeah no good. After gluing my fingers together a few times I took a break and had an ice cream bar. Epiphany! I used a popsicle stick to support the torso while I glued legs into alignment. 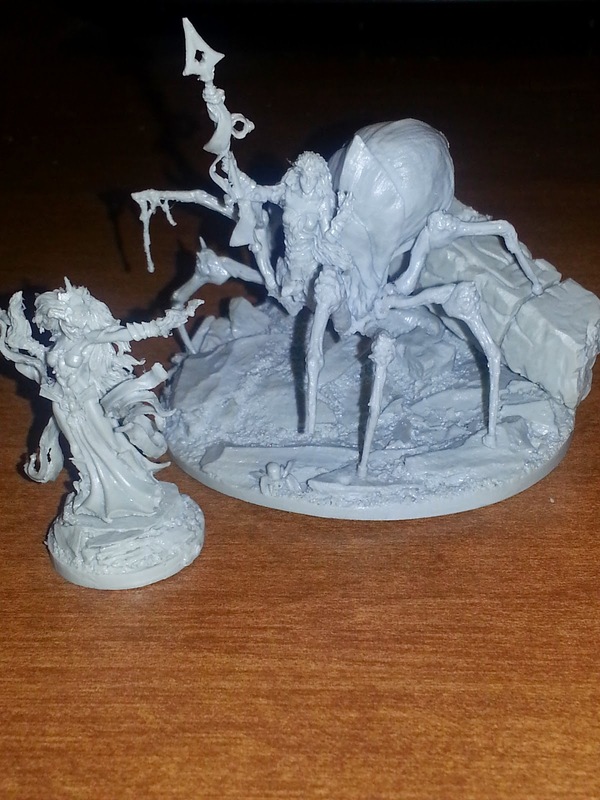 Lolth's legs went into position MUCH easier this way. By the way, there's a notch on the underside of the spider's abdomen that secures to the column. So after getting her front legs on last, I let that dry for a while before tackling the spear arm the next day. It went on fairly easy but then I realized the two ribbons that attach to her spear are all windy and delicate. Advisably I'd try to put those on before attaching to her body next time. At the time of this post I gave up trying. It's a minor detail but as you can see in the first photo of the box it's pretty cool if done right. Maybe tomorrow. 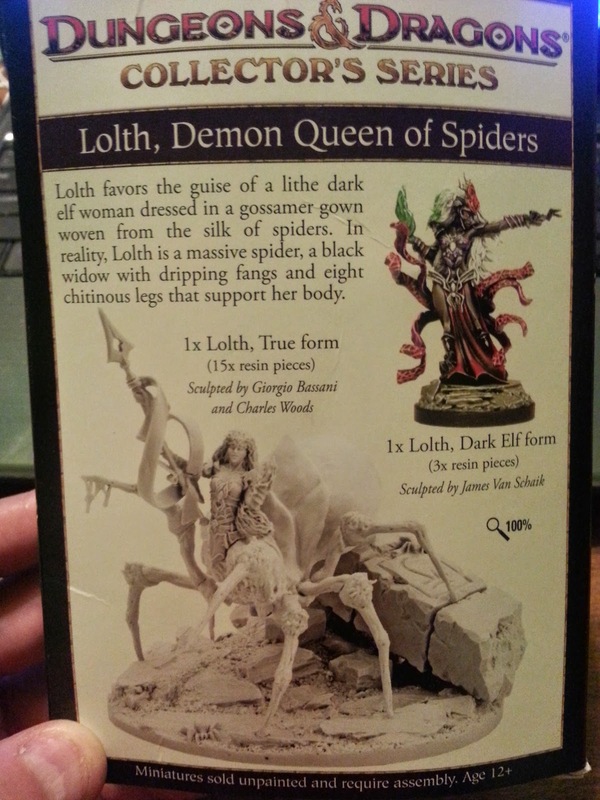 There you have it, Lolth, the Demon Queen of Mini Assembly. Good luck with this one if you ever get the chance. Maybe next year I'll do another demonstration if I ever get around to painting of this monstrosity! The long wait is over for the most recent edition (who's counting?) of D&D. As we all know, the Basic D&D Rules is available as a free download. If you've managed to miss this news by now, go on and get it. It's an easy read even at 110 pages. Moving on, this isn't a rules review. Instead, as I usually do, this post will be about looking for tidbits of "Greyhawkiness" in D&D. I am pleased to say, unlike last time, this heavily playtested, retro-edition so far feels like it's more Greyhawk friendly. The design team, especially Bruce Cordell and Chris Perkins have a suitable background in writing Greyhawk material and the credits go a long way to acknowledging inspiring past authors from E. Gary Gygax and Robert J. Kuntz to James M. Ward and Roger E. Moore. The multiverse of settings is back and Greyhawk is specifically mentioned this time. This can only be a positive. I seem to recall 4th Edition's introduction never mentioned Greyhawk and that always seemed like an intentional move to me. Naturally, it's a Forgotten Realms default publication so it's easy to say the rules are favorable to Greyhawk since the two settings are so similar after all. One thing does bring a grin to my face however; two spells included in the basic spell lists is Otto's Irresistible Dance and Mordenkainen's Sword. That's right, they put the proper names back on classic spells. It's a tiny change, but in a good direction. ﻿Today I was digging through my D&D campaign archives and marveling at the detail I put into many of my maps and "historical accounts". A lot of these works I always did for my own amusement, to keep track of the long running timelines that my group would do. Young me had way more time and energy to record every event that happened in the Flanaess. From players' quest movements, to entire wartime troop movements, I wish I still had the ambition to put a tenth of this effort into my stalled Battles of Greyhawk series. What I'm showing off today is a couple hand drawn maps of the Iuz-Furyondy region (using the Marklands-Iuz the Evil sourcebooks) from June 628 CY to Jan 629 CY. Yeah my timelines always ran well ahead of published canon so I worked in new info as it came out. The amazing thing is I can scarcely remember playing many of the events detailed on these maps. Map #1 has a line showing the path taken to rescue Riggby the cleric (from WG5 Mordenkainen's Fantastic Adventure), Chendl is under siege again, and evil is making gains in the Vesve Forest. Map #2 continues on the next three months and we see that the Vesve is completely overrun, places are pillaged and burned including Highfolk town! 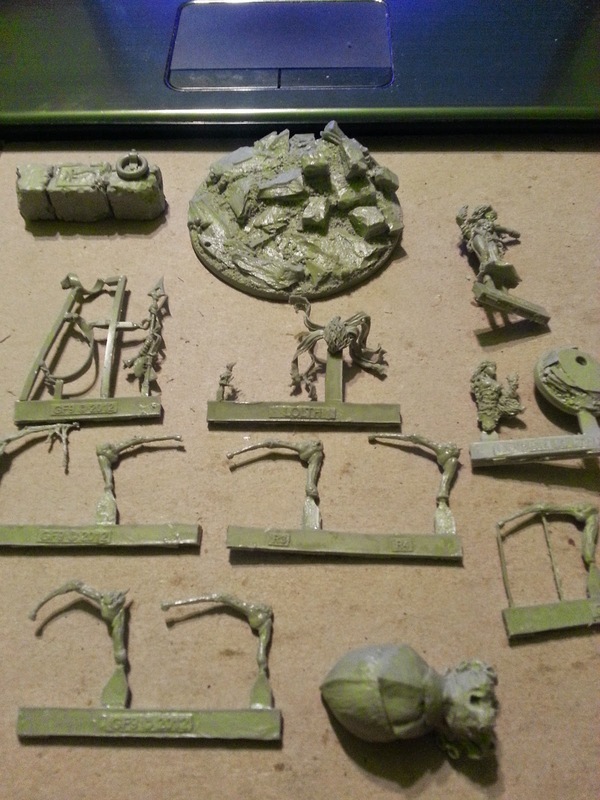 Some group called the Brothers of Panshazek are on the move (not sure if they're canon or homebrew). Willip is sacked, Chendl and Gorsend see major battles. Things are looking bad for the good guys but there is two significant notations which I assume happened at the end of the year, Iggwilv's Trap and Iuz vs. Philidor (yes I went there). I'm not sure what the trap was and if it was for the players or Iuz. I also don't even recall Philidor facing Iuz in Dorakaa but it all surely culminated (spoilers Greyhawk neophytes) with the Soul Husks being destroyed up north in the Howling Hills. So there you have it. You can chronicle your player's exploits by use of timeline maps. While the subject is dry I hope some aspiring DM/mapmaker out there can find some inspiration from these scraps of notebook paper.